There’s nothing quite like a good all-around waterproof jacket. Unfortunately – there aren’t too many good options (at least here in the US) for high-quality rain gear. 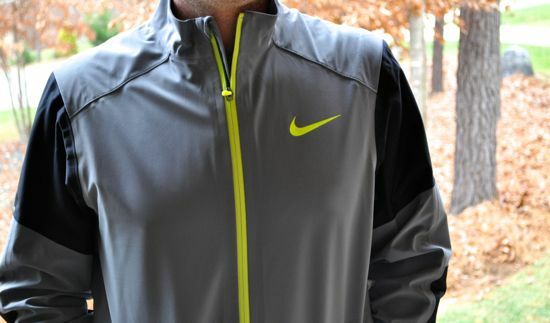 My go-to rain jacket for the past year has been the Nike Storm-FIT series from last year. While the gear has weathered many storms in multiple parts of the world – it’s showing signs of heavy wear. With the recent retiring of my previous Nike rain gear – the introduction of the Nike Hyperadapt Storm-FIT rain jacket was a welcome addition to the gear that we currently had out for review. There are quite a few significant changes from the Storm-FIT series of last year. In fact, this jacket doesn’t have a lot in common with the series from last year. 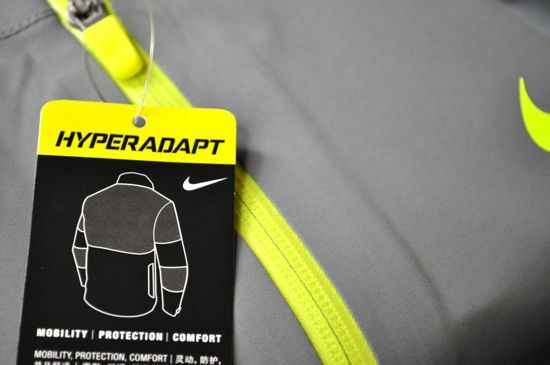 There are many things that stand out with the Hyperadapt Storm-FIT jacket. The two most notable are the materials with their resulting range of mobility and overall good looks of the gear. From a performance standpoint – the Hyperadapt materials are the best that I’ve seen in any rain gear. The jacket is extremely “stretchy” and can easily adapt seamlessly to a high degree of movement. 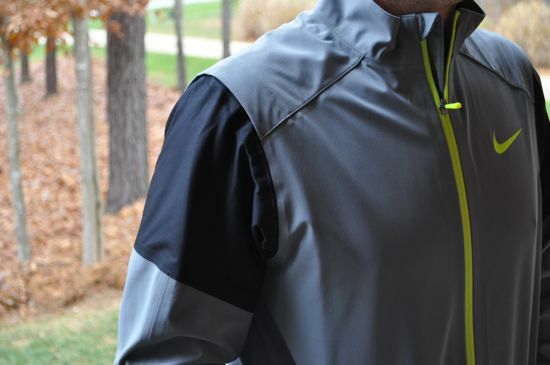 This jacket easily stretches to accommodate anything you can throw at it. The shoulder and elbow areas of the jacket have an extremely thin and thin neoprene-like material that can stretch to a variety of positions without any tightness or restriction. This a performance piece that stays out of your way while you’re playing golf. The freedom of movement is simply incredible. As far as waterproofness goes – the jacket also has you covered there. This is a rain jacket, although it’s just as much at home as a fall jacket and will easily keep you warm in 40 or 50 degree weather. 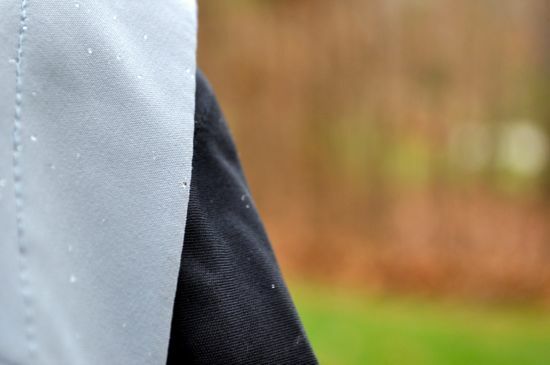 The jacket deflected rain extremely well and the only areas that let any rain or moisture in are limited to anything that can come through the top neck area of the jacket (there’s no hood included or integrated into this jacket). For overall style, the jacket is great. 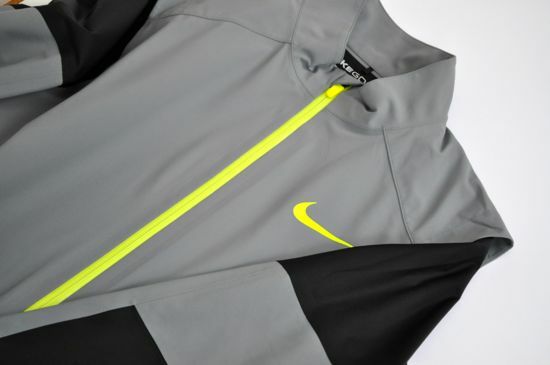 In addition to having clear performance advantages, this is the best looking golf jacket that I know of. 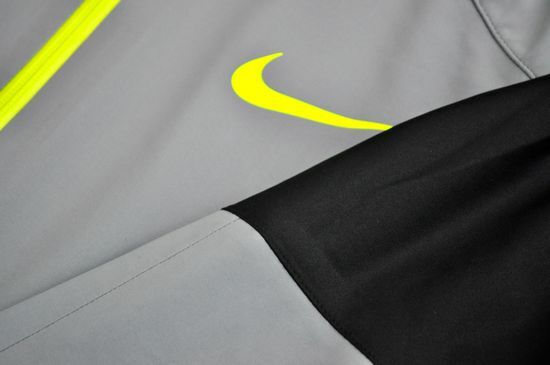 The grey with the pop of yellow gives the jacket a great distinct look and the all-black and all-grey colors are also both excellent choices. There were a few things that I would still like to see in this jacket. The first is the addition of a hood. Believe it or not, I actually enjoy playing golf in the rain and having something to keep my head dry would be a welcome addition. 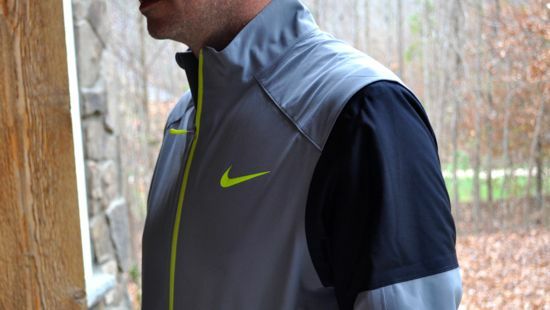 Sure, solving the hood problem for a golf swing is hard – but if anyone could do it then it’s Nike. 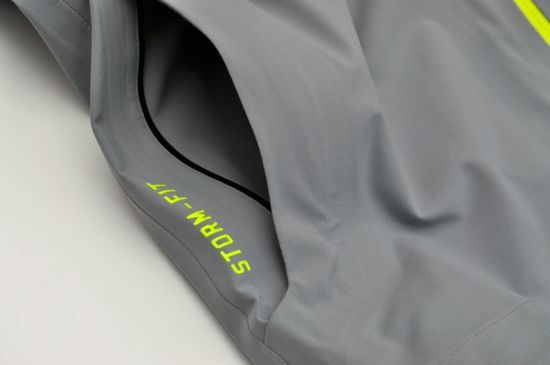 The second thing that I would like to see is the re-introduction of the back pocket that was available in the Storm-FIT gear from last year. The “hidden” pocket from last year was one of the best simple innovations I’ve seen in a long time. 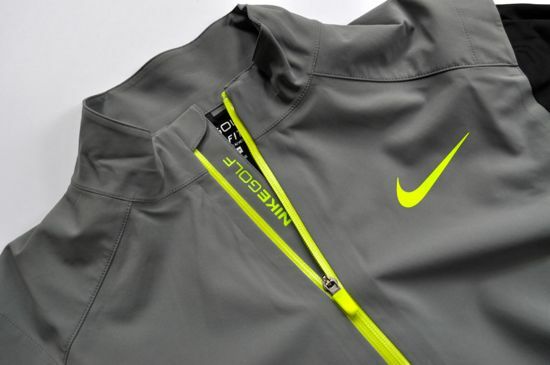 Unfortunately, the idea seems to have died and doesn’t appear to show up on any of the new Nike outerwear. 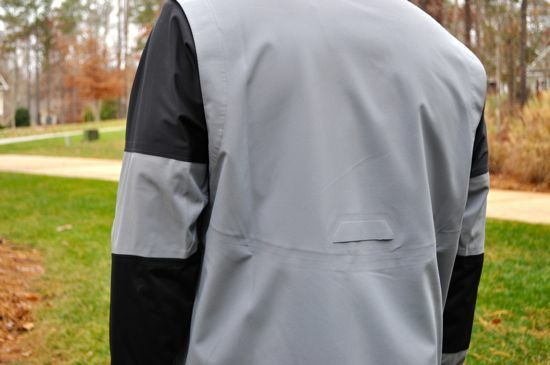 A good rain jacket is critical for any dedicated golfer. Having one that is extremely lightweight and will easily fit into the smallest of bags is a great advantage. Having a jacket that will easily weather the elements while keeping you looking good is a rarity. If you’re looking for a new jacket, be sure to take a closer look at the Hyperadapt Storm-FIT Rain Jacket. It’s a great jacket with all-around great performance.